Knitting, Cooking, Crafting and Dancing up a storm! Auntie Jen gave us the most amazing holiday present–watching the Peach while my sweetie and I saw the movie Sherlock Holmes starring my beloved Jude Law and Robert Downey Junior. My first job was working in a library shelving books and I remember Conan Doyle’s Sherlock Holmes sitting on the shelf always always always there. Never moving. And yet, here it is in glorious technicolor. I do wonder whether or not this movie will help move that book off the shelf. The movie was a lot of fun with a touch of steam-punk. 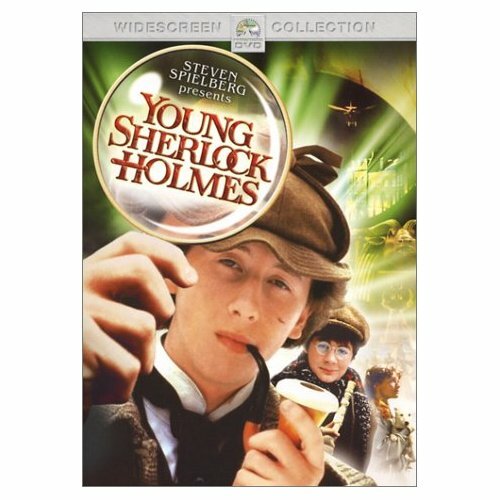 But to me, my heart will always belong to Young Sherlock Holmes. While other teens swooned over Duran Duran, I felt a heart flutter over the awkward British dreamboat that is Nicholas Rowe. What can I say, the geeky 8th grade heart wants what the geeky 8th grade heart wants. Previous Previous post: Happy Holidays! Next Next post: Hullo 2010!